The "Waitlisting" tutorial walks you through how to use the Minerva waitlists. Please note that students on waitlist do not have a guaranteed place in the class. If the section remains full, students on the waitlist will not be able to register. NEW for 2019-2020: For students who place themselves on Wait Lists there have been some important changes made to the running of the Wait List functionality that you need to be familiar with. The Wait List process will now run twice on weekdays, around midnight and again around noon each day. The means you may receive a notification first thing in the morning or around noon. If you are on a Wait List it is important that you check your e-mail twice daily, morning and afternoon. All students will be granted one day to respond to the invitation to register e-mail sent by the Wait List process. Because the process now runs twice daily it is important that you always read the Wait List notification e-mail to know if your deadline to register by is at noon or at midnight. On the last two days of add/drop (Sept. 16 & 17, 2019 for Fall and January 20 & 21, 2020) the Wait List process will run every two hours between 10 a.m. and 10 p.m. In the past this only happened on the last day (Tuesday) of add/drop each fall and winter. How do registration waitlists work? Not all courses have waitlists enabled. If a given course has one, you can join the waitlist from Minerva's Registration Menu. Note that, like courses, waitlists can also become full. If the waitlist is full for a given course, you will not be able to register. If you join a waitlist, you'll receive an update by e-mail to notify you that a spot in the course section has opened. If you receive this message, you will have a limited amount of time to change your status on Minerva from "Waitlisted" to "Registered." New in 2019-2020: e-mail notifications go out twice every weekday, around midnight and around noon. If you are on a Wait List it is important that you check your e-mail twice daily, morning and afternoon. ➪ In the interim, you may view your position on the waitlist on the Minerva Registration Menu : Step 4 View Student Schedule by Course Section. Because email notifications are not sent to inform you as you move up the waitlist, it is advisable to monitor your position on the waitlist regularly. Waitlist e-mail messages will include a registration deadline — this could be two weeks away or the very next day, so check your e-mail often! If you miss the deadline, your spot will be offered to the next student on the list. Why does the deadline vary throughout registration? Although it is the responsibility of students to check their McGill e-mail regularly (especially when they have joined a waitlist) we recognize that during the summer many students have limited access to e-mail. Therefore, deadlines are extended in the summer. In August, as the fall term approaches, this period is gradually reduced. During the Add/Drop Period, students generally have only one working day after notification is sent out. How can I tell if a course has a waitlist? From the Course Section Lookup results screen, look for the NOTE: Waitlisted Section appearing on your desired course section. Check the section's WL Rem number. Go to Quick Add or Drop Course Sections. 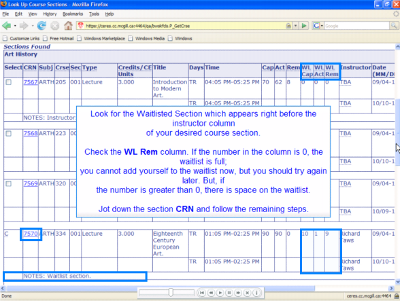 Enter the CRN in the grid of the Quick Add Worksheet and click Submit. Use the picklist to change your waitlist status: Select the Action "Add(ed) to Waitlist" and click Submit. Minerva says there's an open spot in the course, but it won't let me register. Why not? Waitlisted students are allowed a specified time to change their status from "Waitlisted" to "Registered." During this period, spaces that open up are reserved for the next student on the waitlist — even if they appear to be available, no one else is allowed to register. A spot has opened up and I'm next on the waitlist. How do I register for the course? From Minerva's Registration Menu, select Quick Add or Drop Course Sections. The courses for which you are registered and for which you are waitlisted will both display on the screen. Select the Action "Register(ed) from Waitlist," and click Submit. How do remove myself from a waitlist? In Minerva, go to Quick Add or Drop Course Sections, select the Action "Web Drop" for the waitlisted section, and click Submit Changes.